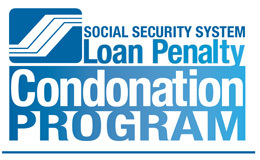 The SSS Loan Condonation Program is still in effect until March 31, 2013. So if you haven’t availed of this opportunity offered by the Philippine Social Security Services yet, you should. This program is an extension of last year’s (2012) which had started April 2, 2012. It was supposed to be a 6-month opportunity and was to end September 30, 2012 but it was extended till the end of the first quarter of this year. As of September last year, 80,994 SSS members have already applied and availed of this offer with a total of Php 1.03 billion penalties already condoned during the said time (Sept. 2012). SSS charges an interest of 1% per month for loan payments that are not submitted on time. This poses a risk for those who are about to receive pension money as the amount they are supposed to receive will be debited to pay for any outstanding or existing loans that are not yet paid. Under this, employers were unable to submit loan payments which were already deducted from the member’s salary. To qualify under this, proof should be submitted including pay slip or affidavit detailing a borrower’s sworn statement. Anyone qualified here are eligible for 100% condonation of late fee penalty. Amnesty is also available for beneficiaries of members who were not able to completely pay their loans prior to death. With the program, beneficiaries can expect to receive death benefits from deceased family members without deductions. Applications can be filed until March 13, 2013 only; however, which is earlier than the actual deadline for other claims. Any other borrower with unpaid loan for whatever reasons can be qualified under this provided that 3 payments have been submitted during application for the program and a minimum of 3 payments within the past 6 months or contributions for the upcoming 3 months. Only 90% of penalties can be condoned though when the loan is paid in full once the application for the program has been approved and 80% when paid on installment for as long as three years. Delinquency of payments due to disability or retirement can also avail of this program. Half of the total amount of penalty will be waived and the other half will be paid through the retirement pension or the disability claim money. Originally, my application at a local SSS office was declined because my loan was still technically fresh. I applied last year and the loan was dated 2011. I was advised to simply pay any amount whenever I can such as Php 5,000 or so each time and so on and so forth. Besides, the amount to be condoned is very minimal and will not even amount to Php 500 due to the freshness of the loan. Although I first read about the program through a banner posted at the same SSS office mentioned above, I also read about it online. There was a link to apply through the official SSS website. So I made another attempt again, this time online. Surprisingly, it was approved and I was asked to submit required documents through a nearby office. As stated, the condoned amount is really low and can be deemed rather useless as I won’t save anything over Php 500. But I was glad nonetheless because payments were at least broken into installments payable until 2015. Please be informed that your application for the SSS Member Loan Penalty Condonation Program under Situation 2 has been approved. Please pay the installment amount of Four Hundred Seven Pesos and Thirty Nine Centavos Php(407.39), on or before the 10th day of OCTOBER 2012 and every month thereafter until SEPTEMBER 2015. Please submit to the SSS Branch Office a copy of proof/s of payment made for Stock Investment/Privatization Fund (SI/PF), Study Now-Pay-Later Plan (SNPLP), and Special Educational Loan for Vocational and Technical Students (Voc Tech), if applicable. In the event of non-payment of at least two (2) months installment, the installment plan will be terminated. The proportionate condonable penalties shall be re-imposed and shall continue to accrue until the account is fully paid. The total loan obligation, if remain unpaid shall be automatically deducted from the member's future benefits. If you’re interested, you can still apply at the nearest SSS office or online through www.sss.gov.ph. Over the web, you can also have access to both member contributions and loans paid per month from the day you have become a member. Hurry and take advantage of the SSS Loan Condonation program while you still can!